Architect's rendering of proposed apartment building. 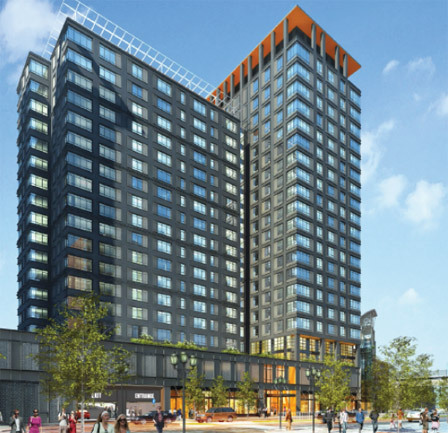 The Drew Company says it wants to build a second residential tower next to its Waterside Place building on Congress Street rather than the supermarket and "innovation space" it had originally proposed. Read more. The Boston Licensing Board tomorrow considers approving a proposal to transfer the beer and wine license held by Gerard's on Adams Street in Dorchester to the soon-to-open Aloft Hotel on D Street - and to grant a new full-service liquor license to Gerard's purchasers, who are planning on renovating the Dorchester institution. Read more. Waterfront land rush over with $359-million purchase? The Globe reports on sale of "the last big chunk of open land" - some ten blocks worth - to a Chestnut Hill developer best known for its malls. Mayor Walsh says his administration and Vertex have negotiated a roughly 25% cut in a property-tax deal for Vertex because the company did not bring as many jobs to the South Boston waterfront as it had originally said it would. Read more. The Boston Business Journal reports on Tishman Speyer's new look for the proposed office and residential buildings it wants to put on Pier 4. The actual old Anthony's building will be replaced with a park. The company purchased the property from another developer, who had BRA approval for its own plans, last December. The BRA announced yesterday that the Society of Arts and Crafts will move into space set aside for cultural uses at the almost finished 100 Pier 4 residential building. Read more. A Silver Line sprinkler system went kablooie near Courthouse station. As of 5:40 p.m., the Fire Department was halting buses from entering the station, water was pooling to about a foot deep in the tunnel and a BWSC crew was on the way. The Grand Prix of Boston will feature an 11-turn, 2.25-mile temporary street course winding around the Boston Convention & Exhibition Center in the Seaport District. The event will mark the first time an Indy car race has been contested in the area. The races will then become an annual event at least through 2020. At least it had the decency to keep from bursting until the weekend, as Brendan shows us. The Boston Licensing Board this week hears a request from the owner of the failed Tonic bar in Forest Hills to sell his all-alcohol license to the owners of the Envoy Hotel, scheduled to open this summer across from the Barking Crab and the Moakley Courthouse in South Boston. 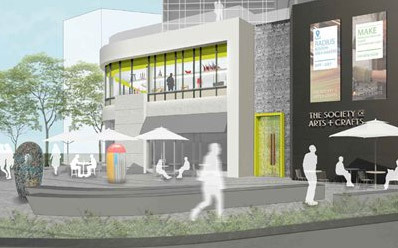 The hotel is planning two bars: A ground-level watering hole called the Outlook and a rooftop bar called the Lookout. Also planned: A 50-seat sidewalk patio. 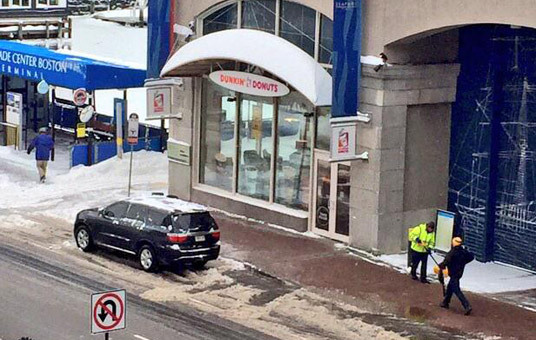 TrueNE_79 reports that the Dunkin' Donuts at the World Trade Center is open this morning, unlike all the other ones from South Station to across Fort Point Channel. Snope reports Tags in Porter Square has plenty of salt - and parking spaces - but is running low on shovels. The City Council today unanimously approved giving LogMeIn a $2.5-million tax break over 13 years for the new headquarters it wants to build at 327-347 Summer St. The Herald reports that Massport is getting ready to build a 1,700-space garage to replace all the parking lots that have been torn up for all the development that is generating all the traffic. that is increasingly clogging the streets of the Innovation District. The Boston Licensing Board decides tomorrow whether to let restaurateur George Aboujaoude open a small-plates restaurant in one of the new Vertex buildings. With the board's approval, Aboujaoude will pay $325,000 for the liquor license being given up by Elephant Walk in Audubon Circle as it moves to a new location. Boston Restaurant Talk reports a deal to open a Wagamama on the other side of Fort Point Channel has fallen through, but that the chain is continuing to look for space in the up-and-coming area. Tim Colby watched the sun come up over Boston Harbor and the South Boston waterfront this morning.